“Two triremes had sighted the ship of Decimus Brutus, which could easily be recognized from its ensign, and bore down on it from different directions. Brutus, however had just enough forewarning to make an effort and propel his ship a little way ahead of them. The two triremes collided at speed so hard that both were severely damaged by the impact, and in fact one had its beak broken off”- Julius Caesar, Civil war, part 2, 6. Reminds me of cartoon slapstick comedy…..
“a good commander should be able to gain as much by policy as by the sword”- Julius Caesar, The Civil War. To think, if not for the failure of Gnaeus Pompeuius’s (Pompey’s elder son) invasian of the kingdom of Bogus, king Bogus may not have been able to help Caesar defeat the Boni/Pompeian’s in Africa, which would be totally bogus. Just finished reading the Spanish war after reading the African war, Alexandrine war and civil war. Aside from being easily the most poorly written (The Spanish, Alexandrine and African wars were not written by Caesar, who was a fantastic writer) about the only thing it illustrates well (there are many lacunae making much of the conflict incomprehensible) is the savagery of this last desperate phase of “Caesar’s” civil war, many have noted that the early part of the war (up to and to an extent including Pharsalus) was notably unbloody considering the scale of the conflict, in part due to Caesar’s famed clementia, the disclipine of his troops and his capacity to convince enemies to surrender or desert, after Pharsalus however increasingly only the real hardliners are left many of whom had already abused Caesar’s initial “mercy” and Caesar’s own troops and himself become tireder and less forgiving. It is perhaps no wonder that Caesar’s account of the civil war stops shortly after Pharsalus, recollections of the African war, and especially the Spanish war could hardly do his reputation for clemency credit nor Roman attempts to heal, the Spanish war was a particularly ugly conflict. I mean after the battle of Munda, the Caesareans constructed a rampart out of the bodies of the pompeins they killed, while sticking thier heads on thier discareded pikes while beseiging the remnants of the Pompeian army………..Sh*t got dark! Piece of advice if ever you offend one of Genghis Khans kin and he suggests the two of you sort it out with a freindly wrestling match, run. Letting the other guy win will not save you (seriusly this seems to be murder code for him). So just read the earliest datable version of the Cinderella (only she isn’t called cinderella) story (at least at the time the article was written which I think was in the fifties). This story purportedly has originates from the natives (non-Han Chinese) of Sichuan and was recorded by a Tang dynasty official and scholar in the 800’s. Instead of a ball we have a ‘cave-festival'(reading into it further it’s possible no caves were involved, tricks of etymology and so forth. ), instead of a fairy godmother (and I suppose the industrious clothes mice) we have the bones of our heroine’s over 10 foot long fish friend, treacherously killed by her stepmother and the king (not prince) arrests and tortures people to get info on the golden (not glass) shoe! Also the stepmother and stepsister get killed by flying rocks for some reason and thier resting place becomes a place for cavemen to make offerings and pray to acquire women. But she of the gold shoe and her fish bones got to go live with the king and his other wives. 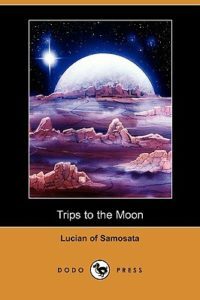 Finally reading True Histories by Lucian of Samosata, I can definitly see why this satire written in the 2nd century AD is sometimes dubbed the first work of Science fiction- even if I the “scifi” element seems to compose less than half the text, it’s got airships (technically), alien abduction, interstellar colonisation, multiple sentient and non sentient alien species, first contact (well depends whether you count mr. abducted but I suppose if you counted backstory…), organ doning or lending, paths through the sky, inter celestial body war and politics, “people” grown rather than born, pregnant men and (sort of) sentient appliances. Also lots of themes and allusians to events from the classical era, particularly in regards to celestial war and politics by way of satire- transposing them to a ridicoulous and overblown context, again Sci Fi has imitated him here, only more often then not we are now expected to take them seriusly;).